“If you want to go fast, go alone. If you want to go far, go together”. This is a famous quote, but to be honest it’s outdated. As the world is changing increasingly faster, you can’t go fast alone anymore either. You need the right partners to go fast ánd to go far, to jointly realize your shared ambitions. Many exponential business models stem from these partners. These are often “uncommon partners”—different types of companies from different industries that work together to benefit from integrated value. 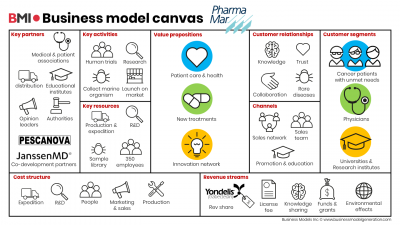 In this blog we will tell you how PharmaMar created exponential value and worked with ‘uncommon partners’ to reach this. PharmaMar was founded in 1986 by José Maria Fernández Sousa-Faro and is one of the leading Spanish biopharmaceutical companies. The inspirational ambition of PharmaMar is ‘to tap into the potential of the oceans to advance cancer treatment’. They want to cure unmet medical needs in oncology and do this in a clever and pioneering way: through the discovery of marine-based molecules with anti-tumor potential. PharmaMar searches the entire ocean to find marine organisms that can cure several types of cancer but realized they cannot do this efficiently alone. Therefore, they built an integrated network of partnerships that support their value creation. One of the most important design principles for exponential growth is building uncommon relationships with partners that bring you further and help you scale. PharmaMar thought deeply about what resources they needed to own and what they could outsource to partners. We tend to think that we have to build everything internally and often lose sight of alternative solutions as searching for partners or finding resources externally. The expertise of PharmaMar is the discovery and development of innovative marine-derived anticancer drugs. Key resources of PharmaMar are a unique sample library containing 200,000 marine organisms and a robust R&D oncology program. They have successfully commercialized medicines as YONDELIS in Europe and has other clinical-stage programs under development for several types of solid and hematological cancers. PharmaMar joined forces with several partners, mostly out of their industry, to grow through alliances across the value chain. PharmaMar has a strategic supplier partnership with Pescanova: one of the world’s biggest fishing companies. Boats from the Pescanova fleet are used to conduct research and gather marine samples for expanding their library. When partnering with such a large company, PharmaMar could scale up easily and accelerate their search for marine organisms. The sales/distribution part of their treatments is not their core competence and therefore, PharmaMar gains access to health professionals and patients through a partnership with Janssen Products L.P. (primarily access to the United States) and Immedica (Europe) that sell and distribute their products worldwide. PharmaMar invests more than 35% of its revenues in research, development, and innovation. It is very important that they are seen as a worldwide leading innovative partner for oncology research and treatment. To strengthen their position as expert, Pharmamar cooperates with universities, educational institutes, and opinion leaders. Also, to show commitment to the use and users of their medicines, they work closely together with patient organizations and medical associations. These are just a few of the partners PharmaMar collaborates with. Their entire business model can be found below. With building partnerships alone, the exponential value is not yet accomplished. Therefore, you have to look at all the different building blocks of an exponential business model. Furthermore, the ambition of a company drives innovation and can make it easier to find the right partners. The transformative purpose of PharmaMar ‘to tap into the potential of the oceans to advance cancer treatment’ makes it immediately clear what their purpose is and what kind of partners could add value to this purpose. With the approach of PharmaMar, they are not only able to grow exponentially but are also creating value for all stakeholders and therefore helping each other win. PharmaMar isn’t working in isolation on their world-changing ideas but realizes you need the power of an entire community to create an even better future together. This challenges you to think deeply about a business model that creates value for all stakeholders in search of long-term value creation and exponential growth. Curious about the strategic value of partnerships for your business? Find out how you can help each other win, by using our Partnership canvas. Contact us for more information!